World War II changed the way Americans celebrate their winter holidays. But those holidays of light also changed the dark experience of war. Some social critics believe that the holiday shopping madness that now begins months before Christmas—as well as the emphasis on gifts rather than religious observance—had its origin in World War II. It took a long time for packages to reach servicemen scattered across the globe, the theory goes, and merchants were only too happy to urge people to shop early for the season. While the war may have brought some changes to the winter holidays, those holidays also brought some changes to the war. 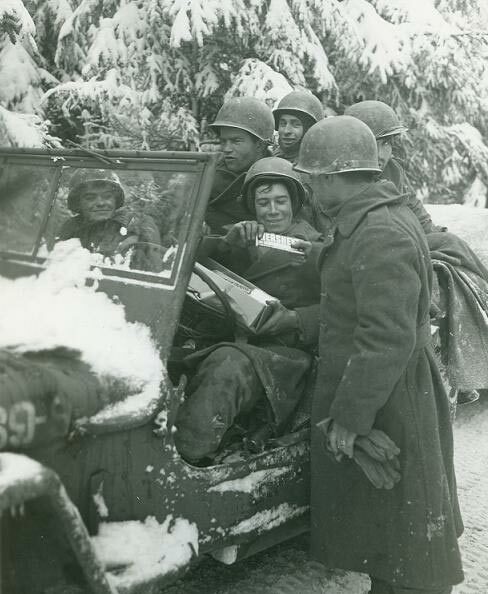 Christmas and Hanukkah gave a sense of hope and home to American GIs immersed in the vast horrors of the war. Charlie McCue, 79, also served on the Chikaskia in the Pacific, as a bosun’s mate. He doesn’t remember any Christmas trees. "We were out in the South Pacific," he says. "Christmas just came and went. Of course we had a good meal. That’s about it. I believe it was turkey. We probably got them the last time we were in port. It was a Christmas meal, but like I say, no Christmas trees, nothing like that. We didn’t have any priest or minister at sea, no special services, but if we were in port, yeah, we’d have services." Paul Meistrich, now 85, served in the navy, as did his brother Saul. His brother Jerry served in Europe with the army. All three survived the war, but Paul, who lives in the New York City area, is the only one of the three still living. "Saul served on an oil tanker in the Pacific," Meistrich says. "He was one of only two Jews on the ship. They were considered lucky, because they prayed every morning after strapping Tefillin (two small leather cases containing Hebrew scriptures that Jewish men traditionally wear on the forehead and the left arm during morning prayer). One day when the ship was under attack and everything was in chaos, the captain came running up to Saul and yelled, ‘Meistrich, have you put on those Tefillin yet?’"
Meistrich spent the war stateside, mostly on the west coast. The holiday season became important as a chance for Jewish soldiers and sailors to visit home. "For servicemen, it was either a chance to go home or to go out and have a good time," Meistrich says. "If you were near a synagogue..., they gave you the day off for religious observance. If you were on a ship or in the field, they were careful to have Passover and Yom Kippur. You always got time off for those two major holidays. I was fortunate to be 40 miles east of Los Angeles, and many homes were open to us." Both Christmas and Hanukkah had been relatively minor holidays in American history. David Greenberg wrote for the magazine Slate in December 1998 that the Puritans who settled Massachusetts made it a crime to celebrate Christmas. The punishment for offenders was a fine of five shillings. Even just before World War II, Christmas was an important religious and family event, but was generally held close to the bosom of the family and community. It was not a major commercial opportunity. The idea of exchanging gifts for the holiday came from a blend of German, Dutch, and English customs. 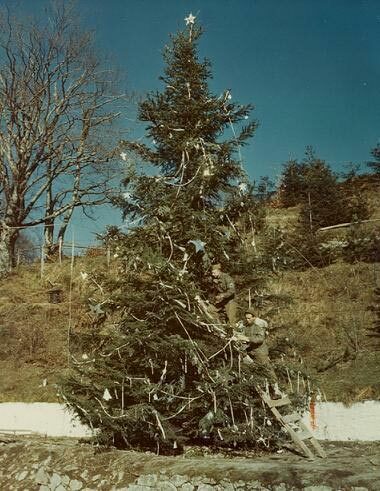 The Christmas tree itself is a pagan custom that originated with the Germans and was Christianized in the early years of the church in Europe. German settlers introduced it to America, where it became popular after the Civil War. Hanukkah, or the Festival of Lights, is close enough to Christmas on the calendar to get caught up in its social and economic currents. It is a celebration of an event that occurred about 2,100 years ago after a battle between the Jews and Syrian Greeks. The Jews won the battle, but their temple had been reduced to rubble. "As the Jews set about to rebuild and rededicate the holy place, they searched for the specially prepared, pure olive oil they needed to light the flame of the menorah, or candelabrum, which is supposed to burn day and night," wrote Greenberg. "Sadly, they found only enough oil for one day, but, amazingly, the oil lasted eight days, long enough for the Jews to prepare a new supply of oil—the miracle of Hanukah. " Gift-giving, not originally a part of the Hanukkah celebration, has become a tradition for children, Greenberg wrote, adding that American Jews were not altogether comfortable with their traditional celebration evolving into something "fundamentally Christian. But parents couldn’t very well deprive their kids of gifts or seasonal merriment, and Hanukkah benefited from convenient timing." Charles H. Glatfelter, professor emeritus of history at Gettysburg College in Pennsylvania, has written extensively on the history of south-central Pennsylvania and its social and religious customs. He said that during his youth, in the decade of the Great Depression before World War II, Christmas was an important, if intimate, celebration. "I think if you look at Gettysburg newspapers leading up to Christmas, you’ll find churches had special services for the holiday," he explains. "The church where my wife grew up...had services on Christmas morning. The church was usually full on that day. In fact, it was one of the best attended services of the year." Although the war ended in 1945, the extended shopping season it helped establish did not. In the space of a few years, Christmas, and to an extent Hanukkah, had evolved from homey religious observances to retail extravaganzas with a thin religious veneer. "It is possible that much of what Christmas is today is a byproduct of the unprecedented prosperity that followed World War II," says Glatfelter. "The view of a lot of people toward the end of the war was that we were going to relapse into the Great Depression. It was difficult to imagine the prosperity that was coming. Nobody realized the purchasing power that veterans and veterans’ families had, and the GI Bill of Rights provided means to go to college and easy terms for purchasing homes." Hanukkah had changed, too. "It’s a post-Biblical holiday, and more of a family holiday," Meistrich says. "It was mostly for the children, because you gave out gifts, like Christmas. We used to taunt the Catholic kids by telling them that we got presents for eight days, not just one. Hanukkah is mostly social, unless you’re very committed." Besides changing the materialistic element of the winter holidays, the war also gave those holidays a new depth of meaning. America had wanted no part in the war that had been spreading across the globe for years. Polls taken in 1940 suggested that 85 percent of Americans wanted to stay out the fighting. The attack on Pearl Harbor changed that. By the end of the war, more than 400,000 American military men and women were dead, and nearly twice that many had been wounded. Almost every American knew someone who had been killed or wounded. The hardest time was in the early months of the war, before American forces got traction, and when advances were few and losses heavy. Even so, World War II was a so-called good war, if there is such a thing—a war where the distinction between good and evil was clear. The United States, perhaps for the last time, was acting united. It was an era of sacrifice—for those in the military, certainly, but also for the civilians. America’s dawning post-Depression consumerism, just beginning to flower when the war erupted, had to be put on hold. Rubber was in short supply because of the war effort and because Japan cut off sources of raw rubber from Southeast Asia. The average American could get only enough gas to drive 60 miles a week, and a Victory Speed Limit of 35 mph was introduced to save gas. People were urged to stay home. Autos became scarce, because none were built after early 1942. Everything that could be used to make materiel for the war effort was used, and at a feverish pitch. Even shoes and food and nylon stockings were rationed. John Fague of Shippensburg, Pennsylvania, has his own recollection of Christmas during the Battle of the Bulge. Now 80, Fague served as a staff sergeant in the 11th Armored Division, 21st Armored Infantry Battalion. "My division hadn’t been committed yet," he recalls. "We came up from southern France, and spent the night, Christmas Eve, in some French barracks. We had Christmas services and the next day headed for the front. We had a nice Christmas dinner in the field, though not exactly in combat." After the war, Glatfelter says, Christmas remained an important time for families to gather together. All those Christmases apart during the war can only have made the holiday more important upon the GIs’ return. "My family had a store," Glatfelter says. "We were open 364 days a year. The only day we were closed was Christmas Day. We always had a meal for all of the family who were available. As far as the significance of Christmas was concerned, it was one of the key days in the year." In the rural hills of south-central Pennsylvania where he grew up, in fact, Christmas as a season of religious significance—if not as a reason to shop—had been woven fast into the culture since at least a century before World War II. "I grew up in Glen Rock, a town which since 1848, without a break, has had a band of singers go through the streets singing Christmas carols, some of which were brought over from England," says Glatfelter. "The story is that the caroling was started by two men recently moved there from England. I believe the motive behind the creation of the caroling group was homesickness. The practice continued through the war. "The singers during the war were very much aware that some of their number was in service. I remember...the case of one soldier still in the country [who] called by telephone Christmas Eve and heard some of the carols from wherever he was. It was obviously important to him. Everyone was aware that there was a war going on, but they [the carolers] didn’t stop. They thought they should carry on." Perhaps the real legacy of the Christmases and Hanukkahs of the World War II years could be the hopeful lesson of those persistent carolers: whatever your worries and plights and heartaches, carry on. Terry W. Burger writes for the Patriot-News in Harrisburg, Pennsylvania. This article originally appeared in the December 2005 issue of America in WWII. Order a copy of this issue now. 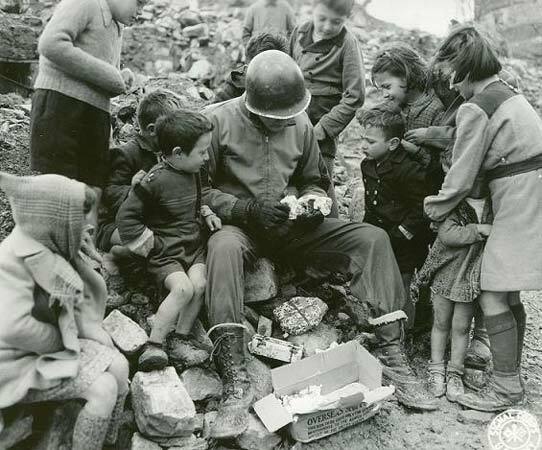 Top pair of photos: US engineers decorate a 41-foot-tall Christmas tree along the highway into Bologna, Italy, and Italian children gather around a GI with hopes of sharing the contents of a gift package he received from home. 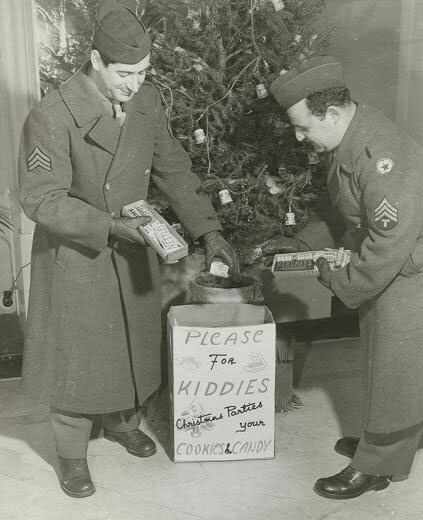 Middle pair of photos: Sergeant William Rush of Washington, Pennsylvania, receives a belated Christmas package on his return from the Belgium front in January 1945, and Sergeants Harold Silver and Isadore Dennerstein donate their candy rations for European children who had little other hope of receiving Christmas gifts. 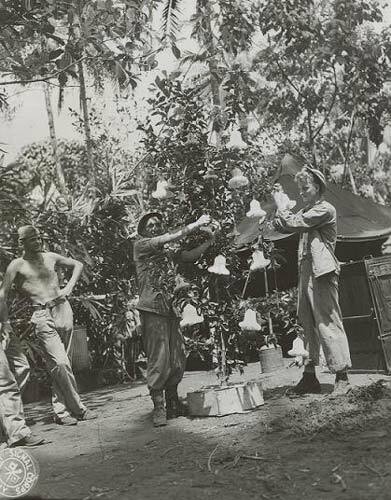 Bottom photo: Marines Arthur Felber and Jack Miller trim a tropical Christmas tree in New Guinea in 1943.